Both of our shepherds' huts are exclusively yours for the duration of your stay. The "living" hut has a wood-burning stove for chilly nights, a sofa which converts to a double bed & table & chairs. The other hut is your wash hut with a toilet, shower, basin & wood-burning sauna so you can relax after fantastic days out exploring Snowdonia. The barn has been divided into 2 seperate units, each sleeping 4. Each has a living and dining room inside and out - the indoor living and dining area has the benefit of a huge woodburning fire that's double-sided so you can still enjoy the fire when you've gone to bed! If the stresses and strains of modern living have all got that bit too much to take, look no further than the wonderful bucolic bolthole that is Snowdonia Shepherds' Huts. 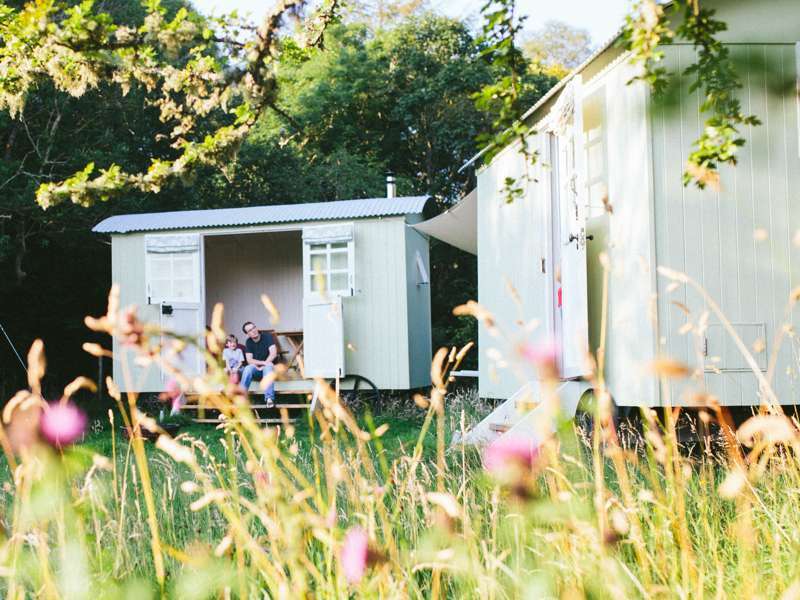 Tucked up in the hills above one of the Conwy Valley's loveliest spots, this fanciest of camping experiences is the ideal panacea for world-weary urbanites who still need those little touches of luxury. What's more, these lovingly crafted shepherds' huts are a favourite haunt for camping couples. And stepping inside the twin huts, it isn't hard to see why. Painted soft, soothing shades of eggshell and tastefully decorated with the finest local woolens, the "living" and "washing" huts are fully equipped with everything you could need for a hassle-free holiday. Oh, and the wash hut even comes with it's very own wood-burning sauna! 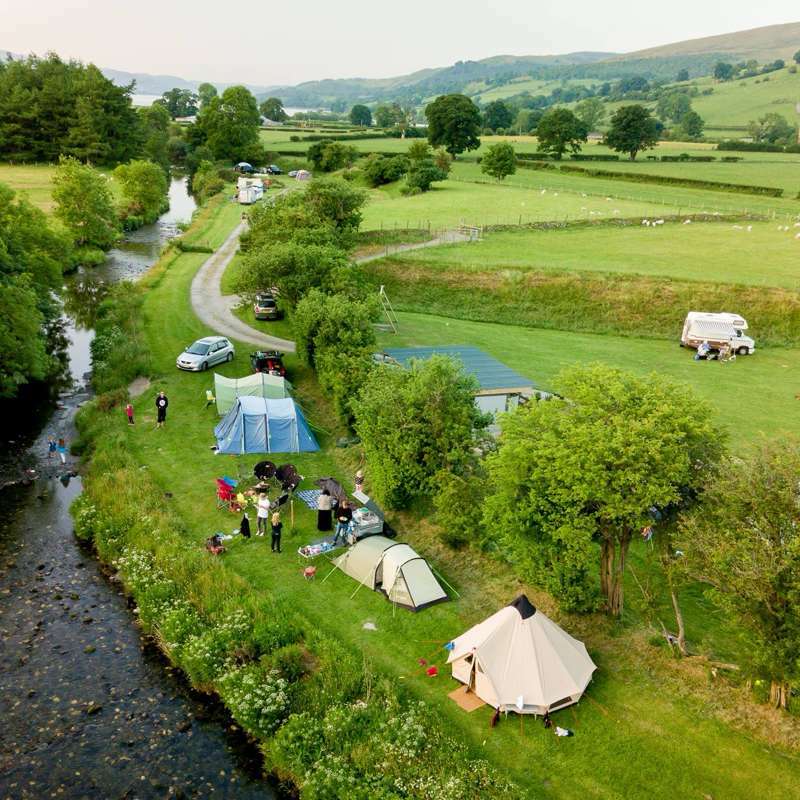 As regular campers to these parts can testify, the pitch-up parade are often at the unforgiving mercy of the frequently boisterous Welsh elements. Inclement weather is of no such concern here, though, thanks to the beautiful cast iron wood-burning stove which transforms your abode into a toasty cocoon of cosiness. In fact, there's very little you could want for here and in the surrounding area. Positioned above a bubbling stream – great for paddling, dam building and a post-sauna dip for the adventurous – the huts are half a mile from the road, along a farm track. Amiable hosts, Richard, Hazel and their children are about the only people who will ever pass by (except for the occasional walker). Even the postie doesn’t come up here! You might see and hear some wildlife though – a heron can often be seen fishing in the stream, red kites whirl overhead and a family of hares live next to the track. You'll hear the resident owls hooting as you sit cosy by your fire in the evenings. Surrounded by beautiful countryside and within a stone’s throw from a good path, there is superb walking and mountain biking right from the door of your hut. Campfires are also allowed in the designated fire pit – perfect for cooking your own. As the Conwy Valley tourist board proudly boasts, Betws-y-Coed is 'the official gateway to Snowdonia'. Although this enviable hillside location within Wales' largest national park does nurture an almost inescapable lure to all things outdoorsy, there is also a refreshing abundance of cultural and historical things to see and do in the surrounding area. With fairytale castles to explore and Wales' largest seaside resort, Llandudno, just up the road, you won't go wanting for fun days out. Then, suitably shattered from exploring the best the area has to offer, you can retire in peace at this wonderfully secluded, riverside retreat. Our cosy shepherds' huts are designed to make the most of their superb location. Listen to the stream as you lie in bed at night, catch the warmth of the morning sun as you enjoy your breakfast, watch our resident barn owl as he hunts over the meadowland and remember to look up at night - there's no light pollution here so the starry sky is breathtaking. Both of our shepherds' huts are exclusively yours for the duration of your stay. 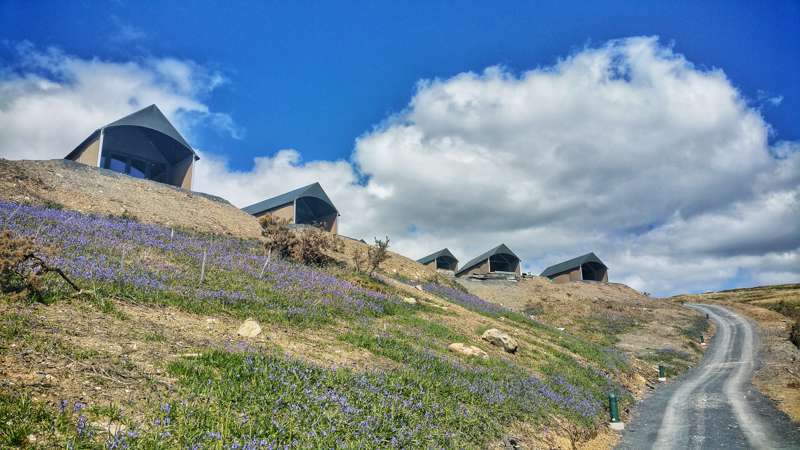 The "living" hut has a wood-burning stove for chillier nights, a pull-down double bed with luxury bed linen, Welsh blankets and a Welsh mountain sheepskin rug. The other hut is your private wash hut where you'll find a toilet, shower, wash basin and wood-burning sauna so you can relax after fantastic days out exploring Snowdonia. You’ll also have a fully equipped outdoor kitchen under a canopy with a triple gas burner, a coolbox and a fire pit. What you won't have is a mobile signal, internet access, TV or even radio. No traffic, no loud music from your neighbours - unless you count birdsong and baa-ing! Just peace, tranquility and the sounds of nature. For latest availability and best prices for Snowdonia Glamping Holidays, please use the Date Search above. 2 shepherds' huts (one holds the bathroom and sauna, the other is living and sleeping accommodation for 2 people), plus a unique shepherd's hut tent for 2 children (optional). Only 1 couple or family at a time with exclusive use of the entire site. There's also a boutique barn for rent. 2 huts – "the living one" and "the washing one". There's a sofa that easily transforms into an extra long (6 1/2 ft) double bed with a lambs’ wool mattress, luxurious feather duvet and pillows and traditional Welsh blankets. There’s a luxurious Welsh Mountain sheepskin, a wood burning stove and a dresser plus small table and chairs. Hazel can also provide a crib/cot for couples with a young baby. The wash hut has a hot shower, a jug and bowl for washing and a flushing, caravan style toilet. There's also a great wood-burning sauna. There's solar powered lights, a cool box with ice packs and the water is the supplied by the farm's own spring water. Outside there’s a fully equipped outdoor kitchen under a canopy with a double gas burner a firepit, deckchairs and giant beanbags for star-gazing in comfort. With Snowdonia National Park's forests, lakes and mountains on your doorstep, there's plenty of walking, cycling and horse riding to be done. This is also proper mountain biking country, so if two-wheels take your fancy cycle down to the Machno Trail or the Marin Trail a little further afield. To up the adrenaline levels a notch, you can also bullet down the longest zip wire in Europe at speeds of 100mph at the now famous Zip World (01248 601444), now host to Bounce Below(giant underground trampolines) the Zip World Cavern experience (yes – underground zip wires!) – not for those of a nervous disposition! Another cool new place making waves in the region is inland surf lagoon Surf Snowdonia (01492 353123) – the first of its kind in the world! No trip to the region would be complete without a visit to that most famous of photo ops, the Cantilever Stone. Conwy Castle is just 17 miles from the site and boasts spectacular views over the Conwy Estuary, with the dramatic Snowdonia mountainscape as its backdrop. The outdoorsy village of Betws-y-Coed and the historic Conwy valley market town of Llanrwst have plenty of places to eat, drink and historic sites to visit. Further north, the seaside resort of Llandudno has buckets-full of red-brick Edwardian charm, plus Wales' longest pier and a passenger cable car that enjoys unparalleled views of Anglesey and Puffin Island. Hazel provides a choice of breakfast packs (continental £18 or cooked £20) which will be at the huts on your arrival with enough food for 2 days hearty breakfast and then some. This part of the world is bursting with fantastic local produce and Hazel is happy to put together a hamper for glampers (enquire within) including Welsh mountain lamb and black beef. For great traditional Welsh fayre in an welcoming pub setting, the beautifully refurbished White Horse (01690 710721) in Capel Garmon is worth a visit. The Bryn Tyrch Inn (01690 720223) and the Ty Gwyn Inn (01690 710383) are both great local places to eat which celebrate the best of Welsh produce. For something a bit different try the very popular Olif (01690 733942), a new Welsh tapas bar in Betws Y Coed. 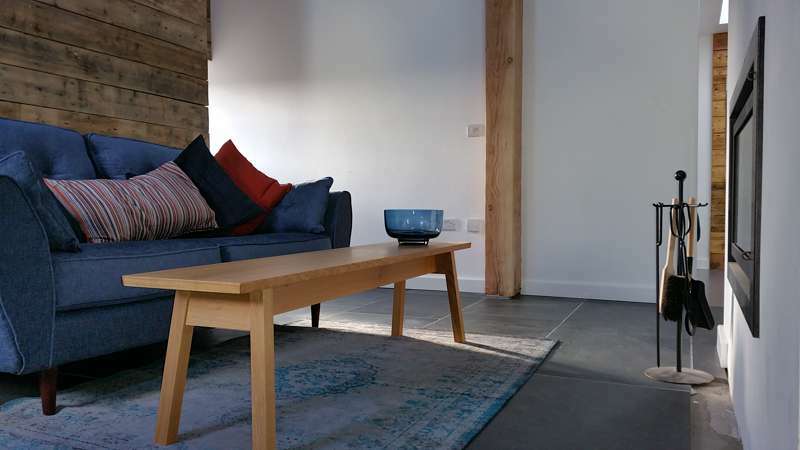 Monday to Thursday nights from £95 per night for 2 for exclusive use of both huts during your stay. 2-night weekend £220. 3-night weekend £300. Add £30 per night for 2 children with the tent (all bedding, towels included). Follow the A5 south out of Betws-y-Coed. After about 4 miles turn left at the sign for Nebo and Capel Garmon. Follow the lane up the hill. After ¾ mile you'll see a sign post on your right for Snowdonia Shepherds' Huts. Follow the farm track downhill, past a house on your right and continue alongside the stream until you pass the shepherds' huts on your right. Cross over the cattle grid to find a grassy parking area on your right. To find the site, carry on along the farm track up the hill until you reach the house at the end.